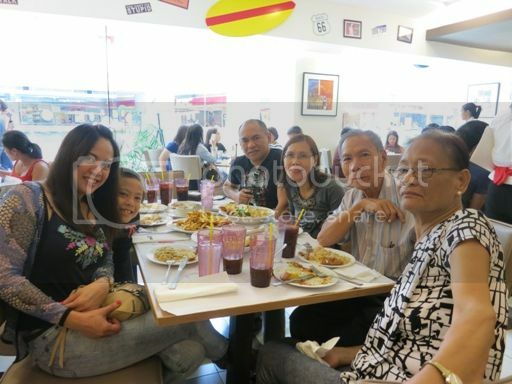 After church last Sunday, we went to Burgoo at Robinsons Galleria to celebrate Mother’s Day. There were seven of us who went: my parents (Justin’s lolo and lola), my younger sister, Justin, me, hubby and our helper. Burgoo has an ongoing promo in partnership with BPI for which we got two free items (Gambas al Ajillo and Louisiana Pizza) for the following items that we ordered: Supreme Sampler, Linguini with Clams and Carbonara. Happy Mother’s Day to Nanay and me! 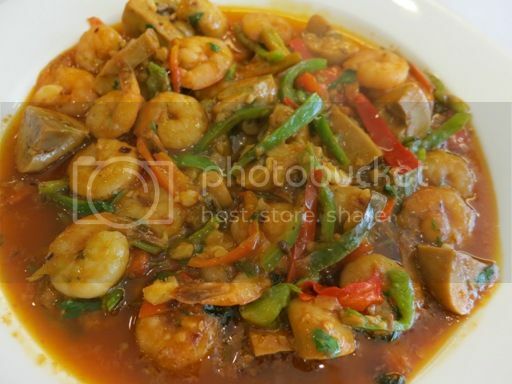 These are prawns sautéed with olive oil, garlic, tomato sauce, cilantro and chili flakes. This Gambas al Ajillo was quite different from what I’ve had in the past because this one’s saucy and had mushrooms. I love mushrooms, so I couldn’t complain, and the serving was huge, so everyone was able to taste this, except the little boy. 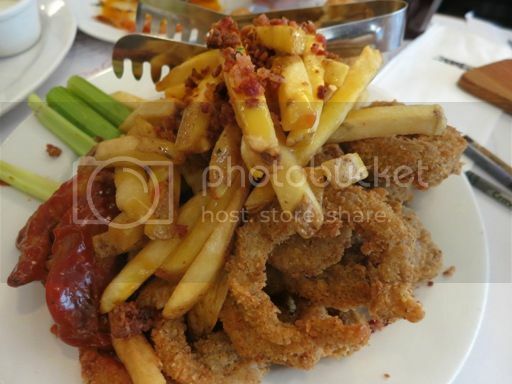 This is one of my favorites at Burgoo. 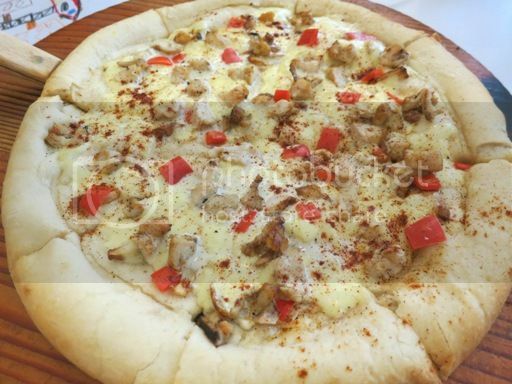 Louisiana Pizza has grilled chicken cubes, red bell peppers and garlic slivers in white sauce. Everyone liked it. I couldn’t help but notice, though, how the pizza dough was thicker than usual and how it had lesser toppings, quite unlike the Louisinana Pizza we had last year during our graduation blowout at Burgoo for our son. This Supreme Sampler was loaded! It had buffalo wings, cheddar cheese fries, mozzarella sticks and onion rings. Our son enjoyed the mozzarella sticks, while I had a grand time munching on the crunchy onion rings. The rest of the family was busy with the buffalo wings. I wasn’t able to try the cheddar cheese fries, though. 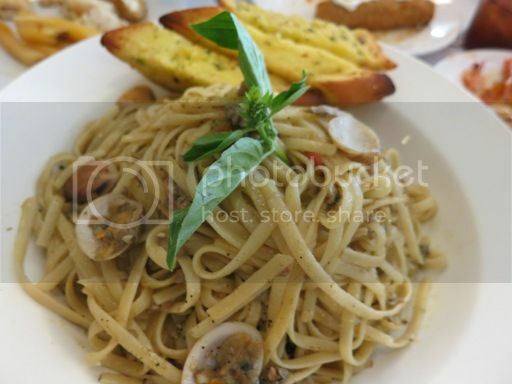 Linguini with Clams is linguini pasta with clams sautéed in olive oil and garlic and tossed in a special clam broth. According to my sister, this seemed tasteless at first, but its full flavor came out after she has eaten more. What an interesting description! I didn’t bother touching this anymore because I was already full. The little boy had a little of this, and he seemed to like it. His lolo, my Tatay, said both pasta dishes were okay. Our Mother’s Day celebration at Burgoo was a Happy Burpday because every tummy was full and happy. This entry was posted in Burgoo American Bar & Restaurant, Mother's Day. Bookmark the permalink. 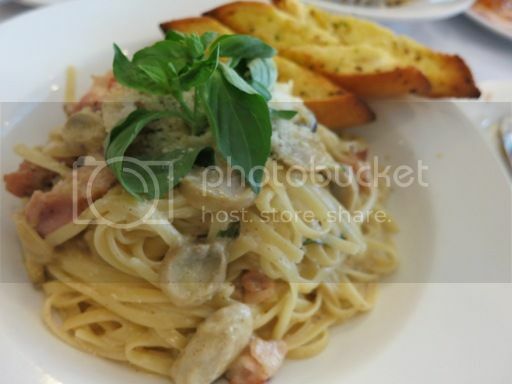 I like Burgoo’s carbonara! Anyway, i’m glad to know that you had a happy Mother’s Day celebration. belated happy mother’s day mommy tetcha! I spent mother’s day half in Kota Kinabalu and half at home 🙂 that looks like a happy Mother’s Day for you!